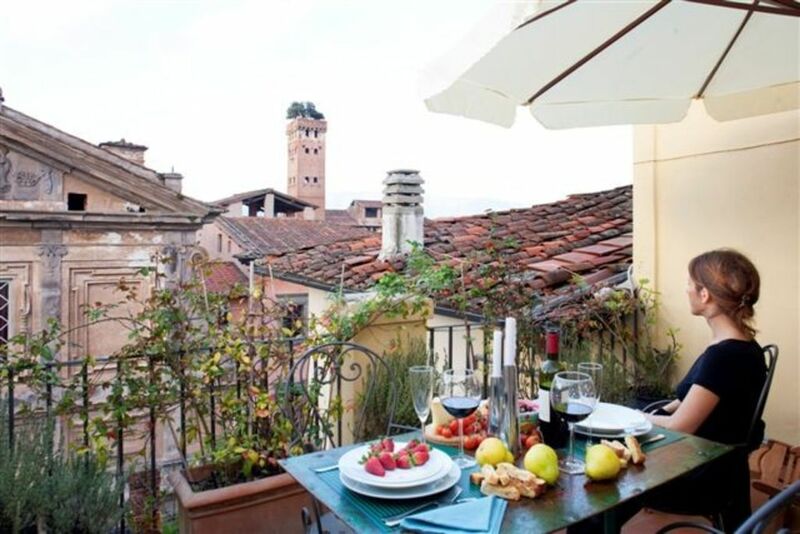 Casa Suffragio is a panoramic apartment with terrace located on the top floor of antique palace with elevator, inside the walls of Lucca. It is very central located, in 1 min walking from the main shopping street and from Piazza San Michele. The area is no traffic allowed so it is very very quiet. The apartment is fully air conditioned and has Wi-Fi connection. Composition: entrance, large living rooms, dining room and fully equipped kitchen, 1 king size bedroom, a wardrobe room, 1 full bathroom. There is also an extra sleeping area to accommodate 1 child. From the living room/kitchen there is access to the terrace with spectacular view over the roofs of Lucca, from where you can enjoy the piano from the nearby music school. The terrace is fully furnished with chairs and table to have breakfast, dining, or simply relax reading a book or with a drink and your loved one while watching the sunset. There is a laundry room with washing machine in the palace which is in common with another rental apartment. City Stay Tax of 4.5 euro per person is requested at arrival in cash in accordance with local laws. Winter heating is charged for 7 euros daily. A baby crib and an high-chair are available upon request. A free parking is located in less than 7-8 min walking from the apartment. The unit was perfect in every way. Dear Kenneth, thank you very much for taking precious time off to share your invaluable feedback with us. It makes me so happy to learn that the most paramount pilar of my service philosophy, accommodating my guests' needs and enabling their desires was met. Thank you for booking my house, we look forwards to meet you again in the future. Sonia and the Lucca Apartments and Villas Team. This place is even better than the pictures. The apartment is immaculate and the location is special. It is very well equipped, and if you're a coffee drinker, use the Moka. You can hear the musicians across the road from your patio. The town is very interesting and it's in a good location. We took day trips to Firenze (Florence), Cinque Terre and Pisa by train. The trains are very easy to use and convenient. The day we arrived, we took a taxi for 9 euros, just because we had luggage and were tired from the long trip, but you can easily walk everywhere in the old town and to the train station. A lot of people rent bicycles to get around. I would highly recommend this place, and hope to come back again. Dear Elsje, thank you very much for taking precious time off to share your invaluable feedback with us. It makes me so happy to learn that the most paramount pilar of my service philosophy, accommodating my guests' needs and enabling their desires was met. Thank you for booking my house, we look forwards to meet you again in the future. Sonia and the Lucca Apartments and Villas Team. We had a great week in Lucca and really enjoyed the apartment, it's in a great spot with plenty of awesome little grocery stores just down the street. Lovely view from the balcony of the roof tops, spent plenty of evenings up their drinking local wine and eating fresh focaccia. Dear Nick, thank you very much for taking precious time off to share your invaluable feedback with us. It makes me so happy to leanr that the most paramount pilar of my service philosophy, accommodating my guests' needs and enabling their desires was met. Thank you for booking my house, we look forwards to meet you again in the future. Sonia and the Lucca Apartments and Villas Team. Loved this sweet little apartment with it’s beautiful little terrace. It’s a bonus being opposite the music school and to hear so many talented students as they learn. Location is perfect too. Thank you Sonia for your welcome we have enjoyed our visit to beautiful Lucca. The apartment was not provisioned at all. There wasn't even toilet paper. The apartment did not suit us at all. The extra bed in the loft was up a steep ladder with no air circulation. We had to bring the mattress down so our daughter could sleep. The house had no provisions for guests. No toilet paper, no soap, no paper towels or napkins, no sugar for coffee. Mrs. Sonia met us there, but was not warm and welcoming at all. She spent most of the time lecturing us about how to deal with garbage. The house requires multiple keys to enter, multiple stairs to maneuver and laundry is across the courtyard and down more stairs. We were so disappointed we left two days early. Minimum stay is 4 nights. City Stay Tax of 4.5 euro per person is requested at arrival in cash in accordance with local laws. Winter heating is charged for 7 euros daily. Legal Notes: Self Catering property: no hotel staff, no maid, no breakfast or meals provided by the owner, no hotel services during the stay.